Explanation: This dramatic high resolution picture looking across the edge of the Sun was taken April 24th by a telescope on board the newly launched Transition Region and Coronal Explorer (TRACE) satellite. It shows graceful arcs of intensely hot gas suspended in powerful looping magnetic fields which soar above a solar active region. The colorized image was made in the extreme ultraviolet light radiated by highly ionized Iron atoms. With a temperature of a mere 6,000 degrees Celsius, the sun's surface is relatively cool and dark at these wavelengths, but the million degree hot plasma loops glow strongly! Such TRACE images follow the plasma and magnetic structures arising from the surface of the sun as they merge with the tenuous, hot solar Corona or outer atmosphere. 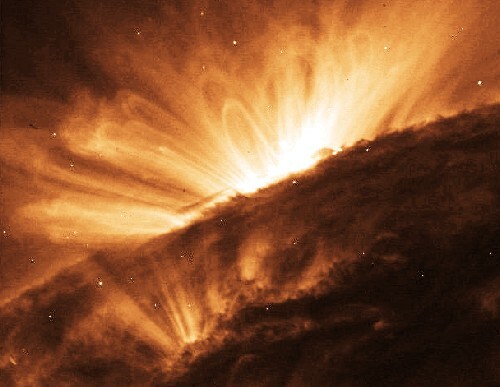 By operating the TRACE instruments during the Sun's increasingly active phase, scientists hope to explore the connections between complex solar magnetic fields and potentially hazardous solar eruptions.